Accommodation at 3 star hotel in everage. After breakfast at the hotel, you will be collected from your hotel in Bangkok and taken to the Floating Market. You will take a longtail boat to the edge of the Floating Market and ride in a paddleboat through the Floating Market. You’ll then walk around and observe the sale and exchange of various goods between parties in their longtail boats as has been traditionally taking place for years.After breakfast at the hotel, you will be collected from your hotel in Bangkok and taken to the Floating Market. You will take a longtail boat to the edge of the Floating Market and ride in a paddleboat through the Floating Market. You’ll then walk around and observe the sale and exchange of various goods between parties in their longtail boats as has been traditionally taking place for years.Back to Bangkok for the visit to some highlights including the Grand Palace which is the official of King Siam since 1782 made up of numerous buildings, halls, pavilions set around open lawns, gardens and courtyards. It is located on the bank of Chao Phraya River. Inside the Grand Palace complex is Wat Phra Kaeo or Temple of the Emerald Buddha – the most beautiful and sacred Buddhist temple in Thailand. The following visit is Wat Arun which is known as Temple of Dawn – one of the best well-known sites in Bangkok. It is best seen from the opposite side of the river. Fly to Chiang Rai - the main commercial centre serving the Golden Triangle border region of Thailand, Myanmar and Laos. Fly to Chiang Rai - the main commercial centre serving the Golden Triangle border region of Thailand, Myanmar and Laos. On arrival, spend your time to visit Wat Rong Khun (also known as White Temple) – the unique northern art temple with the beautiful painting and the chapel of this temple is in pure white and adorned with exquisite traditional Thai style stuccowork, aiming to represent heaven. If time permits, continue with the visit to other main attractions in Chiang Rai such as Wat Phra Kaew where the Emerald Buddha; Wat Phra Singha where the famous Buddha image housed here is believed to be built in 157 A.D. in Sri Lanka or Ceylon and was brought to Thailand in the Sukhothai period (1238-1438). Depart from your hotel in the morning to Mae Sai Border - the Northern most point of Thailand, where you can also experience the local lifestyle of people at the border point. Then continue your trip to the Golden Triangle, where the Ruak River and the Mekong River meets forming the border of three countries, and the opium museum. Thereafter, you will take a boat trip on the river to view the splendor of mighty Mekong River. Back to the hotel for rest. Leave Chiang Rai for Chiang Mai. Stop en route at Sankampang District which is famous for Thai Northern Handicraft Villages, such as silk weaving, umbrella making, wood carving and silvers ware. Upon arrival, check in your hotel and free at leisure rest of the day. You have an opportunity to enjoy a cooking class in Chiang Mai. Our tour guide will pick you up at hotel and go to the local market with chef. Learn more about ingredients, learn to cook the first three courses you choose and have lunch with what you have prepared. You have an opportunity to enjoy a cooking class in Chiang Mai. Our tour guide will pick you up at hotel and go to the local market with chef. Learn more about ingredients, learn to cook the first three courses you choose and have lunch with what you have prepared. Continue the day with the visit to some main temples, such as Wat Suan Dok, Wat Chiang Mun, Wat Chediluang and Wat Phrasing. Drive on to Wat Phrathat Doi Suthep which was built in 1383. It is located 1,050 meters above sea level. See the marvelous golden pagoda, which is containing the holy relics of Lord Buddha. You can enjoy the panoramic view of Chiang Mai City and Ping valley from the summit of Doi Suthep. Then visit Orchid Nursery to see a large collection of more than 50 different types of colorful exotic year-round-bloom orchids. Continue drive to Pai, a tiny town halfway between Chiang Mai and Mae Hong Son with some steep and winding roads through the mountains and valleys via Mok Fah Waterfall one of the highest waterfalls in Doi Suthep - Doi Pui National Park. Stop at World War II Memorial Bridge, This Bridge was built in 1942, at that time the Japanese troops chose Pai to be their military base. Overnight in Pai. After breakfast, drive for Mae Hong Son. Visit Lod Cave where a huge cave system is once a dwelling place of pre-historic man. Experience with take the Bamboo raft reach into the cave; explore the 1 kilometer-long cave along which can be found beautiful stalactites and stalagmites. After breakfast, drive for Mae Hong Son. Visit Lod Cave where a huge cave system is once a dwelling place of pre-historic man. Experience with take the Bamboo raft reach into the cave; explore the 1 kilometer-long cave along which can be found beautiful stalactites and stalagmites. Continue to visit Fish Cave, a special feature is the hollow cave filled with numerous freshwater fish, which is of the same family as the carp. The fish are quite safe from being caught as they are believed to belong to the gods. 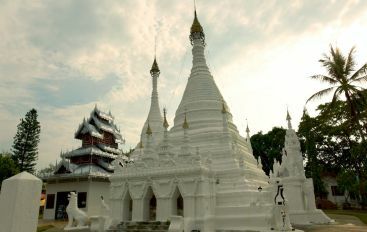 In the afternoon, visit Wat Doi Klong Moo located on a hill to the west of town, is a major provincial landmark. There are two Burmese-style Chedis. The larger one was built in 1860 while the smaller one was erected in 1874. A panoramic view of Mae Hong Son can be enjoyed from the site. Get up early morning to visit the morning market to observe a traditional mode of living of the local Shan people selling foods, vegetables. It will be the great chance to taste the local food here that different from local Thai. After that, drive to the boat landing for a picturesque boat trip through exciting rapid of Pai River to visit the village of the long –necked Karen or Padong to witness the elongated – neck girls wearing numerous brass rings around their necks. Take the boat riding back to Mae Hong Son and have lunch at the local restaurant before driving back to Chiang Mai. Today is free at your leisure for last minute shopping or sight-seeing before driving to the airport for flight home or to the next destination. Such an awesome experience to know about the real life of tribe people and the north Thailand nature. Our guide is so nice and good photographer. He told us a lot about the local culture and the tribe people. As part of our family trip to Thailand we wanted to experience a little more than just the standard touristic attractions Thailand is famous for. This tour promised and delivered in full exactly what we were looking for - a chance to see first hand life at a remote village, meeting people, visiting places and doing things we could never do back home. Our guide, the driver and co-guide were wonderful. Living conditions were challenging at times, but we were prepared and knew what we were getting into. All along the way from the initial contact and correspondence until we said goodbye we encountered a professional, pleasant and dedicated conduct. Definitely one of the most memorable highlights of the trip! Our day visiting the Hill Tribe villages was the highlight of our trip to Chiang Mai. There were 10 people in our family varying in age from late 80s to 9 years old, and every one of us felt this was a valuable, authentic, and amazing tour. Our goal was to visit the Hill Tribes in the most authentic way possible, and from the moment we were picked up, it was clear that was the motto of our guides. The relationships they had with the villagers, teachers at the school, and various people we met along the way made our visit unique and special. A photographer took photos of our day, and shared them with us at the end of our journey. We loved every minute and would count it as a MUST DO!!! Excellent experience with a wonderful, knowledgeable guide. There were only three of us so it was almost a private tour. Everything was worth the time... from the hot springs, the white temple, opium museum, seeing the three countries at once, the hill tribes and long neck women, as well as a the relaxing lunch. Driver and guide took great care of us: cold water, rest stops and explaining everything. When the guide can answer our questions besides the main information they plan to tell everyone you get your money's worth. Loved visiting Chiang Rai! I have wanted to see the White Temple for years and it did not disappoint. What a sight! There were many other interesting things to see and visit in the area. Thoroughly enjoyed the Hill Tribes, Emerald Buddha, Black Museum, and Opium Museum. It was nice having the opportunity to spend the night so we were not rushed. Our guide did a terrific job sharing the highlights of the area with us.